Brokerage firm CLSA said in the media report that the company is set to witness demand headwinds as the auto sector is reeling under pressure. It sees the company's revenue at risk as auto OEMs (original equipment manufacturers) form 45% of its revenue. Shares of Kansai Nerolac Paints slipped 3% in the morning trade on Friday after the foreign brokerage house has downgraded the stock to sell from underperform. Brokerage firm CLSA said in the media report that the company is set to witness demand headwinds as the auto sector is reeling under pressure. The company's revenue is at risk as auto OEMs (original equipment manufacturers) form 45% of its revenue. Further, the company’s target price has been lowered to Rs385 from Rs450. Rising crude oil price is another unfavourable factor that will weigh on the company, the brokerage firm said. 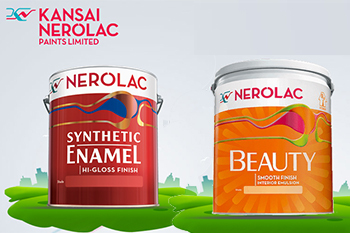 Kansai Nerolac Paints Ltd is currently trading at Rs445, down by Rs15.5 or 3.37% from its previous closing of Rs460.50 on the BSE. The scrip opened at Rs445.90 and has touched a high and low of Rs451.05 and Rs438.95 respectively. The BSE group 'A' stock of face value Rs1 has touched a 52-week high of Rs540.45 on August 13, 2018, and a 52-week low of Rs343.40 on October 23, 2018. Last one week high and low of the scrip stood at Rs476.50 and Rs454.15 respectively.